Right, straight on with part 3. 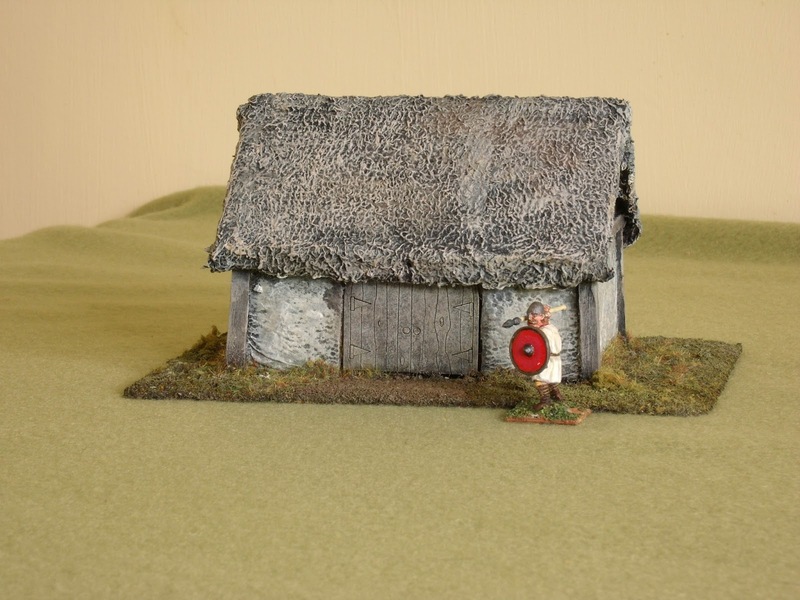 Any farm or village would need a barn, whether to store the things that needed keeping but you didn't want piled up in the house (turnips, perhaps?) or for large things that the house simply wouldn't hold (like the plough). You've now seen quite enough of how these are put together, so I won't bore you with a "how to" sequence. 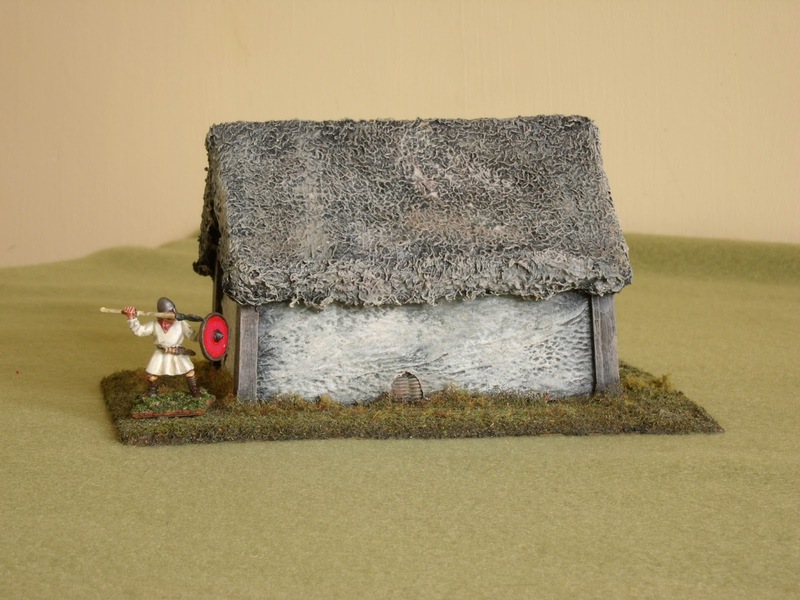 The basic block of foam is 100x70x70mm - a bit bigger than the granary. I went with fewer wall timbers on this one, just some humungous corner posts. Any intermediate posts are inside on this building. The doors are (again) from Warbases. I made every door on every building I had constructed up until these last three. Frankly I was a bit skeptical about pre-made doors like this, but I when I saw some up close at Vapnartak, I was very favourably impressed. The guys at Warbases (really lovely people - so helpful!) didn't have to try very hard to get me to part with my money, as their products are VERY competitively priced, especially given the quality. I am very happy with the results. I won't say I'll never make another door myself, but I certainly wouldn't default to building my own like I used to. So here it is, finished and ready for the table, with a dubious Saxon ne'er do well for scale. Fairly soon now I'll have some decent upstanding Sub-Romans to chase him off, but in the mean time he shows scale nicely. Must be something worth stealing in there! These three projects averaged out at about three hours work each: a bit more for the granary and the pig sty, a bit less for this one. However you shake it out, I don't think nine hours work to put three reasonably sized, interesting and quirky terrain pieces on the table is a bad investment. Cost wise, the whole lot probably came to under five quid - cheap even for me. Here's another view, just for completeness, and to show I did finish the back! Since it's a big expanse of nothing, I inset a bit of home-cast wattle panel (made from Fimo clay) into the wall to add a bit of interest.